EPA recognized the one-year anniversary of TSCA reforms by issuing three new rules, releasing a guidance document, and providing scoping documents for the first 10 chemical risk evaluations under the revised law. President Obama signed the Frank R. Lautenberg Chemical Safety for the 21st Century Act (TSCA reforms) into law on June 22, 2016. The Act amended the national primary chemicals management law known as the Toxic Substances Control Act (TSCA). Finalized a rule to establish EPA’s process and criteria for identifying high priority chemicals for risk evaluation and low priority chemicals for which risk evaluation is not needed. Finalized a rule to establish EPA’s process for evaluating high priority chemicals to determine they present an unreasonable risk to health or the environment. Finalized a rule to require industry reporting of chemicals manufactured or processed in the U.S. over the past 10 years. This reporting will be used to identify which chemical substances on the TSCA Inventory are active in U.S. commerce and will help inform the chemicals EPA prioritizes for risk evaluation. Released guidance for external parties interested in submitting draft risk evaluations to the EPA for consideration. The final rules are expected to become effective 60 days after they appear in the Federal Register. 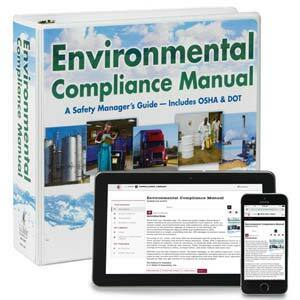 J. J. Keller's Environmental Compliance Manual is packed with easy-to-understand information on regulations, environmental issues and compliance.